Habit: Shrub or tree; generally dioecious, often bisexual (in California). Stem: older bark smooth or becoming furrowed, generally gray; lenticels broadly elliptic; twigs cylindric to 4-angled, glabrous to hairy; developing short-shoot spurs. Leaf: simple or generally odd-pinnate, opposite, deciduous; petioles channeled, occasionally winged, hairy or not; if compound, leaflets (1)3--9, lanceolate to ovate or obovate, generally acute to acuminate at tip, entire or +- crenate-serrate, generally dark green adaxially, pale abaxially, thin to +- leathery in drier habitats, generally glabrous or with simple hairs abaxially or throughout, proximal opposite on rachis, stalked or not, terminal generally largest, stalk longer. Inflorescence: axillary, of clusters or long-branched panicles; flowers pedicelled. Flower: unisexual or bisexual; calyx 1--2 mm, shallowly +- 4-lobed to cut, persistent on fruit; petals 0, 2, or 4, free or fused to basal filaments. Staminate Flower: stamens 2(3); pistil vestigial. Pistillate Flower: stamens 0; style slender; ovules 2 per chamber. Fruit: achenes, winged, wings generally flat, extending to tip or base of seed-containing chamber. Seed: generally 1. Species In Genus: +- 65 species: temperate. North America, Eurasia, tropical Asia. Etymology: (Latin: ancient name) Note: Fraxinus uhdei (Wenzig) Lingelsheim, Mexican ash, cultivated in western United States; similar to Fraxinus velutina, with +- larger leaves and leaflets, generally with stiff hairs to 0.5 mm bordering abaxial midvein and occasionally 2° veins abaxially (as occasionally in Fraxinus velutina), and +- larger fruit, but margins tapered to near base of fruit body; native northern Mexico to Honduras. Habit: Tree < 25 m, trunk < 1.5 m diam; dioecious. Stem: bark gray-brown, furrowed; twigs cylindric, brown-gray, +- long-shaggy-hairy or glabrous. Leaf: compound, 12--33(50) cm, +- long-shaggy-hairy or glabrous; petioles 3--7(9) cm, channeled; leaflets (3)5--7, 4--11(14) cm, 2.4--7.5 cm wide, ovate or oblong-(ob)ovate, broadly wedge-shaped to +- rounded at base, acuminate at tip, entire to +- serrate, lateral leaflets +- sessile, terminal leaflet +- larger, stalk to 10--35 mm. Flower: petals 0. Staminate Flower: calyx > 0.5 mm, 4-toothed; anthers 2, 2--3.5 mm. Pistillate Flower: calyx +- 1 mm, finely irregularly cut; style +- 3 mm; stigma +- 1.3 mm. 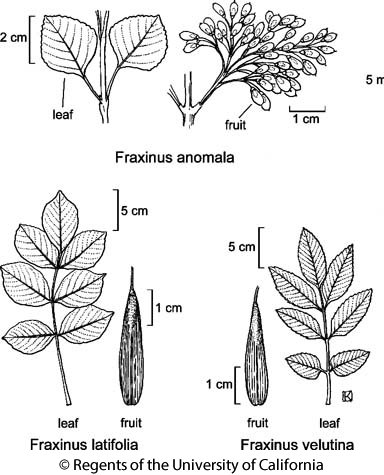 Fruit: 25--50 mm, 5--9 mm wide; body 15--18 mm, +- cylindric, wing flat, extending proximally as tapering margin down 1/2--3/4 body; fruit pedicel tip much expanded. Chromosomes: 2n=46. Ecology: Canyons, streambanks, woodland; Elevation: < 1700 m. Bioregional Distribution: NW, CaR, SN, GV, SnFrB, MP; Distribution Outside California: to British Columbia. Flowering Time: Mar--May Note: Pure in northern California; mostly introgressed with Fraxinus velutina in southern California. Unabridged Synonyms: Fraxinus oregona Nutt. ; Fraxinus pennsylvanica subsp. oregona (Nutt.) G.N. Mill. Citation for this treatment: Family description, key to genera by Thomas J. Rosatti; treatment of genera by James Henrickson 2012, Fraxinus latifolia, in Jepson Flora Project (eds.) Jepson eFlora, http://ucjeps.berkeley.edu/eflora/eflora_display.php?tid=26105, accessed on April 22, 2019. NW, CaR, SN, GV, SnFrB, MP; Markers link to CCH specimen records. Yellow markers indicate records that may provide evidence for eFlora range revision or may have georeferencing or identification issues. Purple markers indicate specimens collected from a garden, greenhouse, or other non-wild location.